I totally have a thing for chunky scarves. Almost all of my Pinterest style inspiration pins feature great jackets topped with big, knit scarves. I think a great scarf really pulls an outfit together. I’ve been reaching for this particular scarf on a daily basis ever since I knit it, which makes it a winner in my book! The basketweave stitch is so easy (even for beginners!) and it creates a pretty, woven effect. It’s created by knitting clusters of Knit and Purl stitches for a set amount of rows and then reversing the order of the stitches. 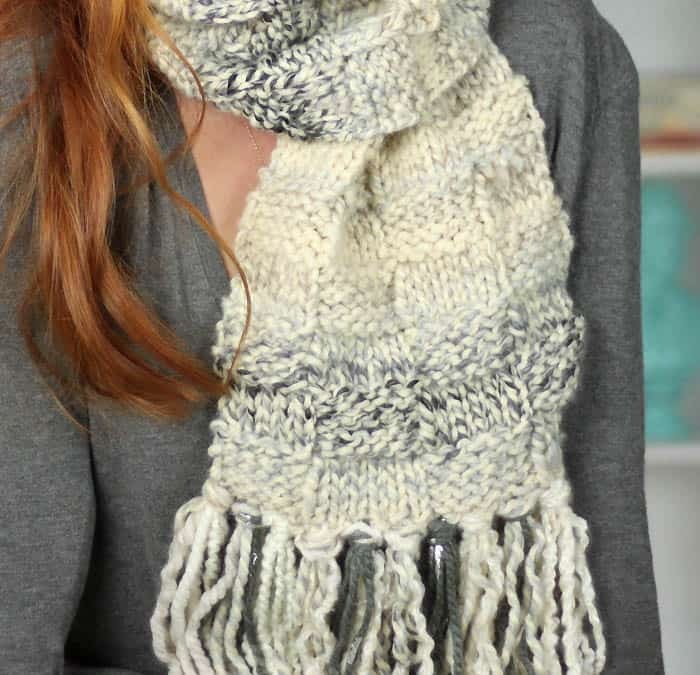 If you can Knit and Purl, you can make this scarf! For finishing touches, I dug into my scrap bin to make the fringe. I chose several bulky weight yarns in similar colors. Not only was this a great scrap busting project, I think the contrasting colors really compliment the scarf. I like how this scarf is neutral, but not boring. I hope you guys enjoy the pattern. Happy Knitting! Rows 1-6: Knit 6 sts, Purl 6 sts, Knit 6 sts, Purl 6 sts. Repeat these 12 rows until piece measures 46 inches from the cast on edge. Fringe: Cut 3 strands each 20 inches long. Fold in half, insert through stitch and pull ends through loop. 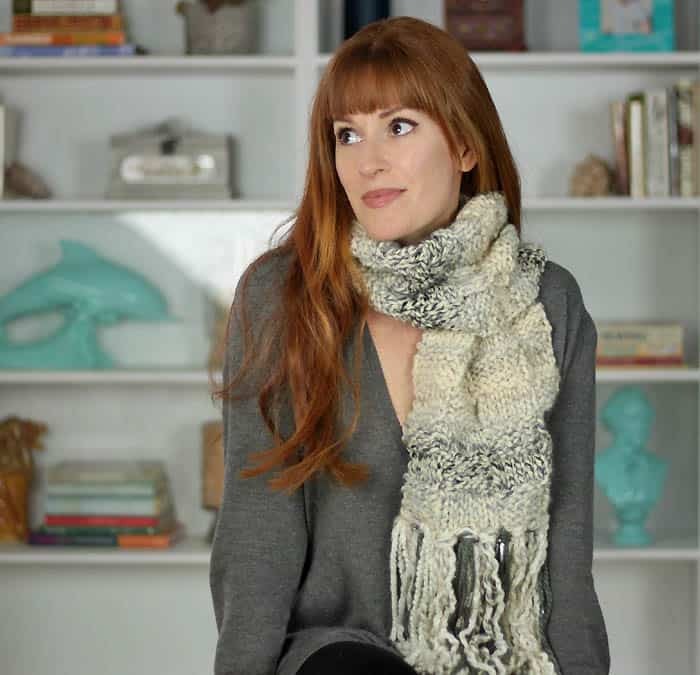 Want more Free Scarf Knitting Patterns? 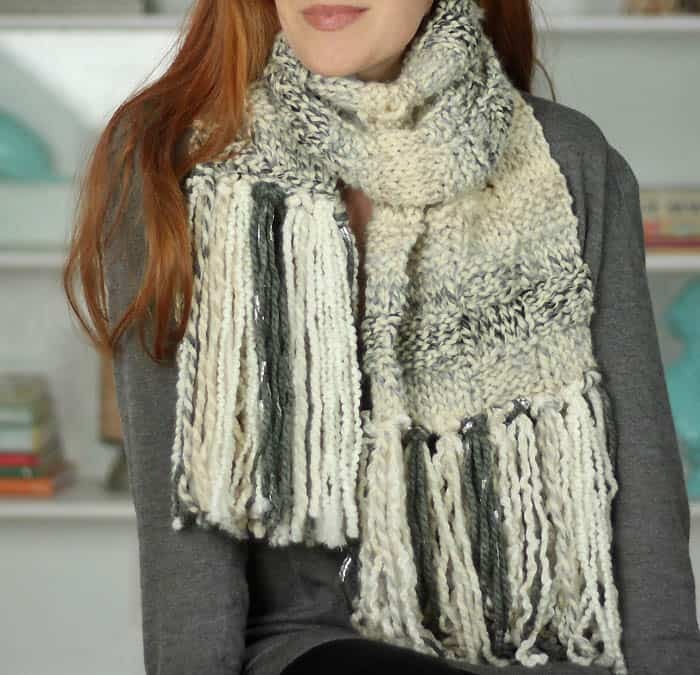 Please tell me what yarn you used for tis scarf – I just love it!